An apple a day keeps the doctor away! Well, I’ve got six apples…. 1. Planting an apple seed from a particular apple will not produce a tree of that same variety. The seed is a cross of the tree the fruit was grown on and the variety that was the cross pollinator. 2. It takes energy from 50 leaves to produce one apple. 3. Apples are a member of the rose family. 4. Archeologists have found evidence that humans have been enjoying apples since at least 6500 B.C. 5. Fresh apples float because 25% of their volume is air (thank goodness, or none of us would have ever experienced bobbing for apples!). Crochet a basket to put the knitted fruit in? That will use up some yarn. They’re serious cute, I may try to make a jumbo one for my bed. The little ones would be asking for my cat to steal them. AWwwww surprisingly my doggy is not attacking my knitted stuff! Love your apples. Might have to try making them too. Also, the pictures you took of them, are great. 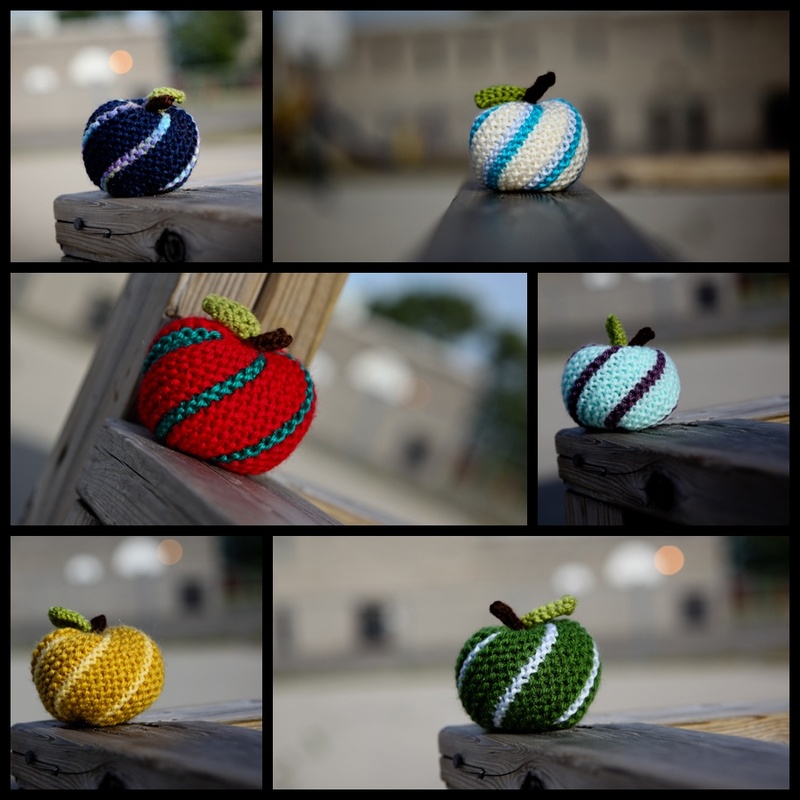 They make the knitted apples shine! You’re very talented. Why can’t all apples look so cute and colorful? Those are awesome! I love to crochet toys – I am a very slow knitter, but I am currently knitting a fall sweater for my crocheted doll. Yes, yes, I totally understand! YAY!!!! I know when the Christmas holiday comes around, i’ll be knitting many more of these for the tree! Oh my, oh my. Love! Love those apples. They’re just so freakin’ cute! Oh my gosh SO CUTE. I’m going to have to make some of these to put on top of gifts. Super, super adorable. That’s such a great idea to put them on top of gifts! Adorable! I might make some of these for my coworkers. Love the white and yellow apple :) so adorable! Keep up the awesomeness! This is soooo cool! I’ll try them – They should be fun! :-) Thanks so much. Aww I love these! They are super cute! Thank you again! Now I will venture off to different kinds of fruits! 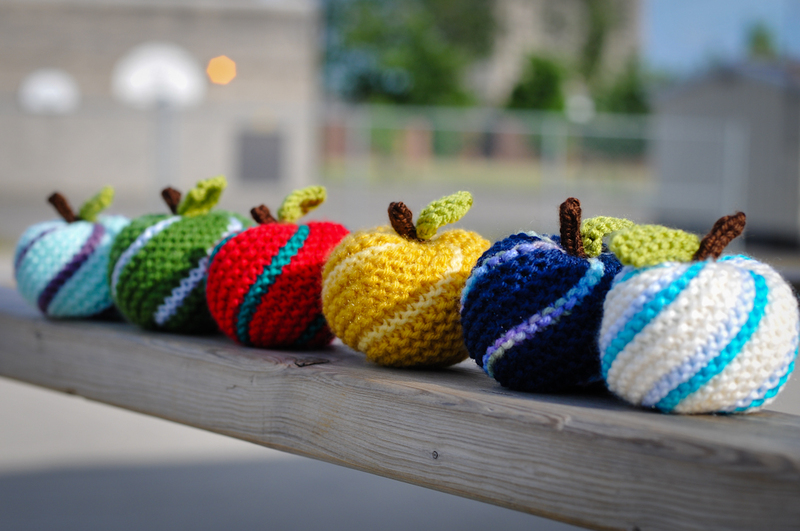 I’ve seen a lot of cute knitted/crocheted pears online! HAHAHHA YES!!! 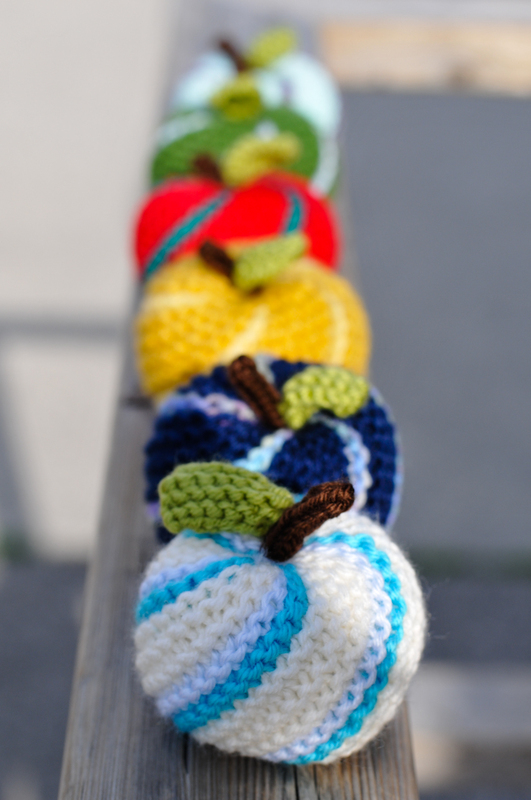 Thank you for the sweet comment again :) Can’t wait to see your knitted apples when you get hold of that stuffing! Thanks for giving us a big smile…so pretty. Reblogged this on Sandeep Wadhawe Summary.